Roy the Zebra is a fun site for emerging readers. This well designed website features interactive reading games, guided reading stories, literacy worksheets, and even songs. All of the interactive reading games are listed here. Students will enjoy the 9-part guided reading story of Roy the Singing Zebra. Dive into the world of Roy the Zebra today! 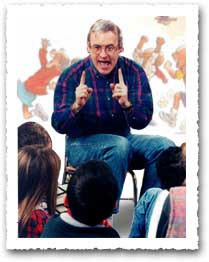 Robert Munsch is the author of the beloved book Love You Forever and many other wonderful titles for children. On his official website, you can listen to the author read many of his stories! Each story takes only a minute or two to download and will be a fun addition to any child's mp3 collection. Listening to stories being read by this great author can help students remain excited about reading throughout the summer. Go to the Storytime page and get started! Check Out these Great Links, STAR Students!! The STAR in STAR Program stands for: Support Targeted Assisted Reading. Metamora Grade School in Metamora, IL proudly offers this program to students who need a little extra help with reading.